These are 100 pieces of Chien Lung coins made from strong genuine bronze from another reputable factory. Material wise, they are made from genuine bronze with lasting reliability. Chien Lung coins are essentially endorsed by all authentic Feng Shui masters to be the most supreme of all chinese coins for overall luck attraction. They are the most potent wealth magnet and are always recommended by Feng Shui Masters to be used to activate luck for tycoons, successful politicians and rich people. 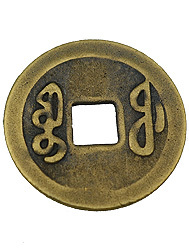 An ancient secret recently revealed by old Asian's tycoons and Hong Kong businessmen is that they always display or bury Chien Lung coins in their West and Northwest direction of their mansions or gardens. In modern days, where digging a hole in your apartment or modern townhouses are impossible, you may simply activate the metal energy of these corners by keeping or displaying the Chien Lung coins kept in treasure bowls or chests. What the chinese coins symbolize? Chinese coins are essential ingredients in the practice of Feng Shui. It is the most potent symbol of wealth, especially when tied with red thread. They are rounded shape with a square hole in the center. The circle represents heaven while the square represents earth. When used by humans, they represent the cosmic trinity of luck of "Heaven-Earth-Man".There is the Yang side (with four chinese characters according to reign of emperor) and the Yin side (2 characters) on every chinese coins. The Yang side should always be used facing up. Feng Shui masters often focus only on Ching Dynasty coins compared to other dynasties because Ching was the most powerful dynasty in China, while other dynasties usually collapsed in less than a century. The Chinese coins, particularly of those of the Kang Hsi or Chien Long Emperors' reign are deemed most auspicious. Chinese coins are creation of old advisors of emperors (who are Grand Feng Shui wizards) and that is why chinese coins are powerful emblems of wealth, endless fortune and prosperity. They are also powerful amulets to protect against harm. Today, these coins had been duplicated to be used extensively in Feng Shui because real ones are rare and hard to get. Furthermore, old coins may have stale chi left behind if not properly cleanse correctly. To activate the coins further, they are tied in multiples of 3, 6 or 9 with red thread. 3 represents the trinity of heaven, earth and mankind luck; 6 represents heaven luck; and 9 is the number representing the wholeness of the universe and completeness. Loose Ching Dynasty coins (especially from Chien Lung or Kang Hsi) are auspiciously used in a massive manner. The reign of Chien Lung was considered the most powerful and prosperous period with international trade massively taking place, China going through a peaceful period and the nation enjoying tremendous wealth. Using Chien Lung coins signifies getting solid financial luck and support from Emperor Chien Lung. Feng Shui enthusiasts are advised to purchase a couple of hundreds of duplicated coins for Feng Shui purpose, as they are inexpensive nowadays. However, it is important when selecting the make of the coins. We should select those made from fine metal material like bronze and brass. Some are made of resin which will not have similar power. 1. They are placed together with wealth symbols such as Money Frog, Chi Lin, Dragon Tortoise, Pi Yao and Wealth Deities. 2. You may also place 6 loose Chien Lung coins in your rice urn with real money in a "red packet" (angpow) to multiply your income. Similarly, you may also put 6 loose Chien Lung coins into red packet to be sitted by wealth symbols for activation purposes. This is a secret reinforcement method to empower the Feng Shui wealth symbols. 3. Loose coins are also essential to fill up wealth ships and wealth vases. They should be in multiplication of a hundred. 4. For the tycoons and those who wants to be extensively rich, you may purchase them in bulk and plaster them into your walls and under your floor tiles or carpets to create abundance. Living in a bed of prosperity coins are deemed extremely auspicious and you will be blessed with a life filled with riches. 5. Create a treasure chest filled with loose Chien Lung coins and bury it in the northwest corner of your garden or home to create abundance or mentor luck. 6. You may also implant nine of these coins with Yang side on top and Yin side on the bottom in the paving stones leading to your doorstep to signify lots of money paving their way to your home. You may also tape them under a thick floor mat. 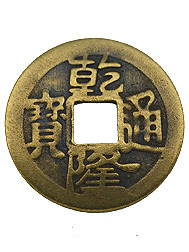 Note: Feng Shui Bestbuy offers coins that are made from genuine brass and bronze and is really strong in nature. Try not to get those coins that are made from resin and is very brittle. It is better to refresh these coins each year on the first day of the Lunar New Year. It is best to get new ones, or you can cleanse them using incense or singing bowl.